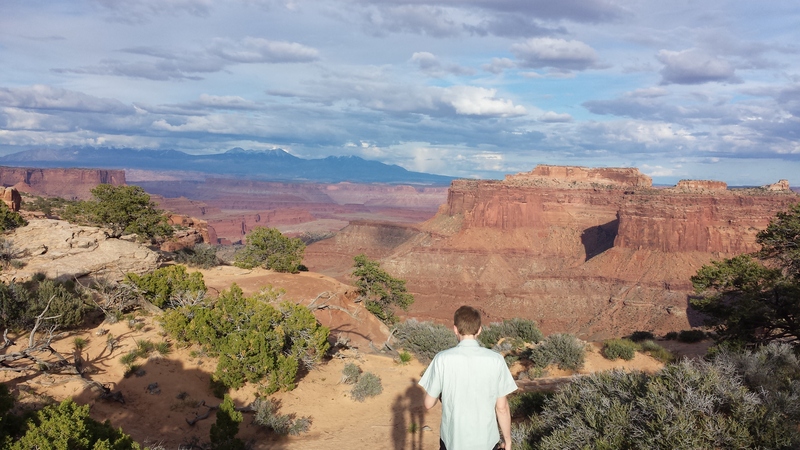 May 14: We set out on the first day of our road trip, which started in Chicago (home) and continued on to Denver/Boulder, Canyonlands in Utah (the most beautiful place I’ve ever been), Vegas, and the Grand Canyon. 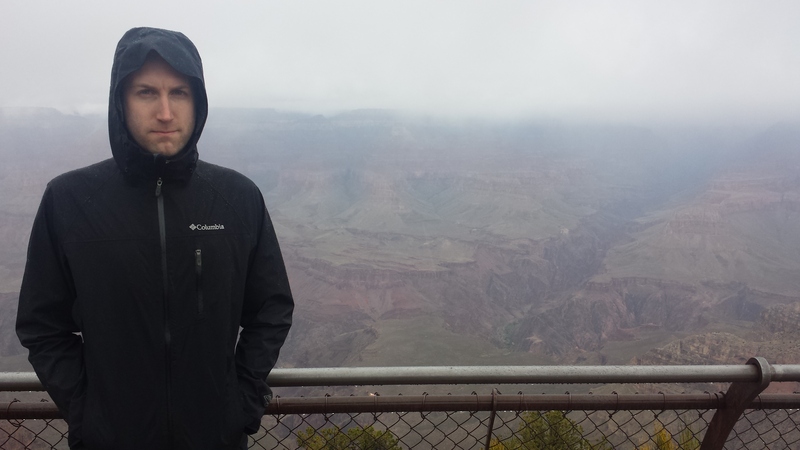 After seeing the Grand Canyon (which was barely visible since it was sleeting that day :-/), we planned on spending the night in the small town of Gallup, New Mexico, before heading to Santa Fe and then eventually making our way home. May 22: I was gazing up at the stars through the sunroof right after nightfall when I felt a huge thump. “Oh my god. I think I just hit a white wolf,” says Marc. The phrase was so ridiculous I laughed out loud, but the laughing quickly turned to mild terror when we realized that the radiator was busted, leaving us stuck on the side of the road in the middle of nowhere, Arizona. Apparently white wolves coyotes get real big out in the Southwest (RIP coyote). After sitting two hours in genuine fear that a Jeepers Creepers–type character was going to steal me and eat my skin, a tow truck arrived and we spent the night at a Travelodge in Holbrook, AZ. Long story somewhat shorter: We got a rental car for the next few days and explored Albuquerque and Santa Fe before driving back to the body shop in Holbrook, where we learned that the car would take at least a few weeks to fix. We couldn’t afford to take any more time off work, so a flight back to Chicago it was. 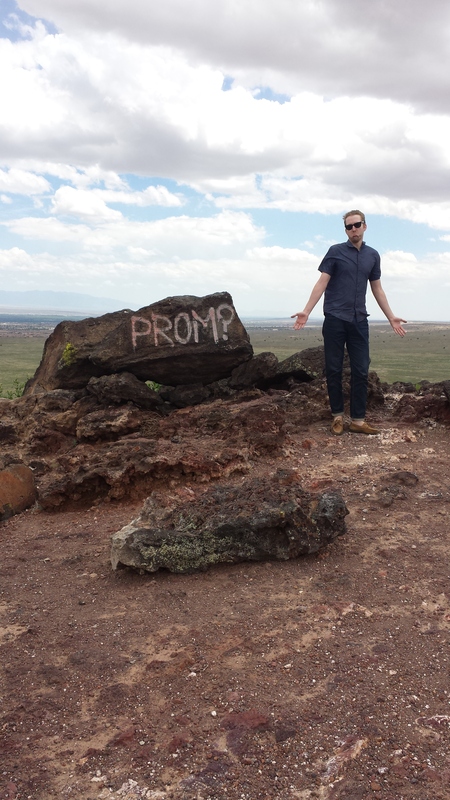 Marc asked me to prom in Albuquerque. I said maybe. 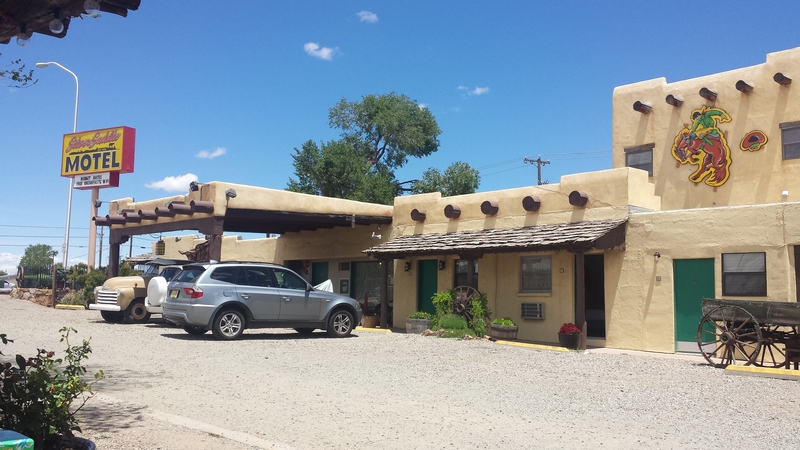 The Silver Saddle Motel in Santa Fe was our home for three nights. July 23: Nine weeks later, the car was finally fixed. We flew back to Phoenix and drove a rental the three hours from the airport to Holbrook, and then spent the next 2.5 days driving back to Chicago. Aside from almost hitting a stray dog eating roadkill in the middle of the road (crisis averted), the drive was blessedly uneventful. Humid as hell, but uneventful. SAGA OVER. 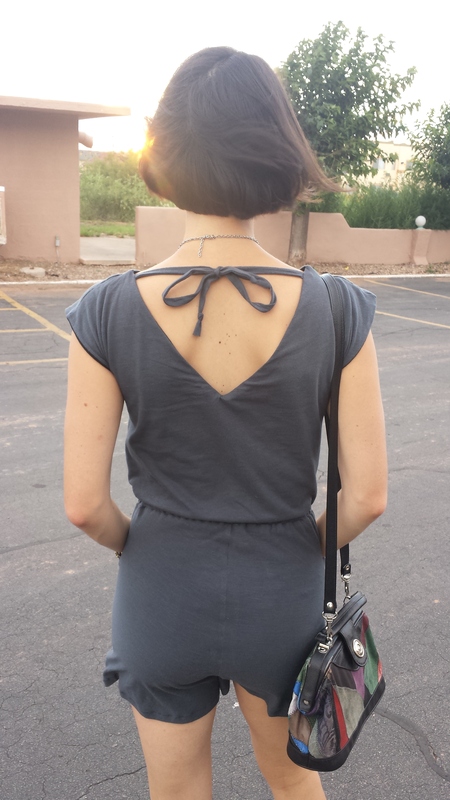 So as timing would have it, this iteration of Sallie made it’s debut in Phoenix, Arizona, on a 100º evening. It was so comfy—despite the heat—that I bust it out the next night in Tucumcari, New Mexico, another middle-of-nowhere town along old Route 66. Cut a straight size 10, adding 1.5″ to the bodice and lining and lengthen the bottoms 1″ at the lengthen/shorten line. I bought 4 yards of this gray knit fabric (not sure of the content, I picked it up for $2.95/yard at Textile Discount Outlet in Pilsen) with the intention of making a jumpsuit muslin, but then I decided to go with the romper length. After making a romper muslin (which was necessary bc of crotch length issues), I had ALMOST enough to make my “real” version, but I had to use a similar black knit for the lining. It peeks out a bit, but it doesn’t bother me. I think I could afford to go a tiny bit shorter with the length, but it’s comfortable as is so I might just leave it. For construction, I cursed the fact that I don’t have a serger, and then sewed this up using my regular machine and a ballpoint needle with either a straight or zigzag stitch, depending on the seam. I broke my twin needle (WAH!) so I hemmed the shorts with a zigzag, too. 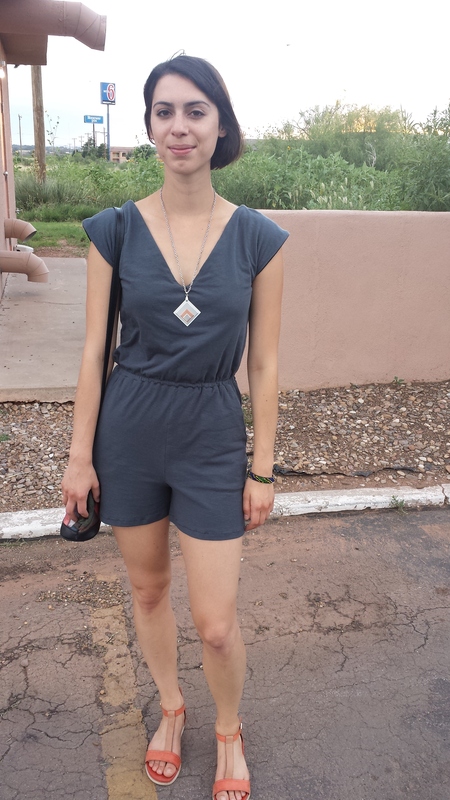 I never thought I’d be a romper/jumpsuit person, mainly because whenever I’ve tried one on the crotch looks obscene. It turns out that I LOVE this romper because it actually fits my torso. If you’re on the fence about this look, I highly recommend giving this pattern a try, plus you get maxi dress and tank options if those are more your thing. How do you feel about jumpsuits? Willing to give ’em a go? I love jumpsuits and have literally just bought the Sallie pattern. Your romper version is great, it looks really good on you. Thanks! I’ll keep an eye out for your version. I think I might be a jumpsuit convert! You already know how much I love this. I would have never gone for grey myself but I LOVE it on you and am now going to keep my eye out for a nice grey knit…. Adorable, I need to try this for summer!